Yuppie Chicana: It's okay to be Chingon! Once upon a time in a not so far away land called the Southwest, a man married a woman. The man was from Mexico and the woman, well her story has been taken off shelves. She could have been Native American, Anglo, or maybe even a beautiful African goddess. She bore this man many children and raised them to be muy chingon. Today, the children of those children thirst for knowledge of her life, her history, her being. Some of these children live in Tucson Arizona and in true Chicano fashion; they are raising hell to be heard and to be counted. They are muy chingon. 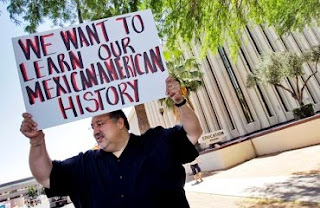 You may have heard of the ban on ethnic studies by the Tucson Unified School District. With budget cuts affecting school districts all over the country, one might say the ban on Mexican American studies is not personal. If only it were that simple. Books have been banned and literally removed from library shelves in an effort to eradicate anything related to race, ethnicity or oppression, according to an article by the New York Daily News. TUSD’s decision to suppress books on oppression has not gone unnoticed. A group of individuals from Texas calling themselves the librotraficantes have made it their mission to smuggle contraband books back into Arizona making them available again. Why would anyone want to study Mexican American studies in high school? There are many reasons but the most obvious is to feel empowered and important. According to the Pew Research Center, being Hispanic doesn’t come easy. A large percent of our young people drop out of high school more frequently than Blacks, Whites or Asians. An even larger amount of us live in poverty and even a greater percentage become mothers by age 19. It’s no wonder young Latinos seek an escape from the difficulties of life. For many that escape is learning and celebrating their history. When I first heard about Chicano Studies in college, something clicked for me. After just a few courses, I felt whole. Now I could add the brave tales of Reyes Lopez Tijerina to my knowledge of American History. Some proponents of the ban feel that the Mexican American Studies curriculum breeds hatred for white people. The point of ethnic studies is to highlight multiculturalism and celebrate it. Many Chicanos, me included, have Anglo family members that we love dearly and they love us. Despite what the opposition says, most of us have no intent on taking over the country by force. We are a people, not a religion. Maybe one day there will be a Mexican American President in the White House. Until then, we just want to celebrate our chingon-ness. Don’t worry. We’ll try to keep the music down. I felt the same way after my first Chicano Studies class! I now have my college degrees in it! Punk Rock Mom, great name!!! Thanks for your comment. Where did you graduate from? I'm assuming somewhere in the Southwest?